Like many other online services, Argyll Hotel Glasgow may use ‘cookies’ to store and sometimes track information about you. A cookie is a small amount of data sent from the server, which is stored on your PC’s hard drive. Cookies may be used to customise your service and may allow you to sign-in. If you have any questions or concerns about our use of your personal information please contact Argyll Hotel Glasgow. Argyll Hotel Glasgow is committed to your right to privacy. 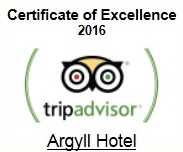 Argyll Hotel Glasgow are committed to handling your information responsibly. We will not store or use your details for marketing purposes without your express permission and if at any time you wish to “opt-out” of such use then you may contact us via the enquiry form and we will remove your details from our mailing list. Argyll Hotel Glasgow will never pass your details onto any third parties for marketing or sales purposes.